The question was asked: Is the conversation about agriculture issues more emotional today than ever before? Responding before the crowd at the University of Northern Colorado for the day’s panel on Colorado agriculture, Paul Sater, a Kersey-area farmer, threw in his two cents. Sater said only a generation or two ago, everyone was just a grandfather or other relative away from the farm or ranch, and now, with only about 1 percent of the population involved in ag, an unknowing public has questions — leading some to even have suspicions. Taking the emotion out of the ag-conversation equation and providing information for voters on Colorado agriculture was the goal of the League of Women Voters of Greeley-Weld County, who hosted the event. On the panel was Bill Jerke, a LaSalle-area farmer and former Weld County commissioner and state legislator; Brent Lahman, relationship manager at Rabo AgriFinance in Loveland; Ray Peterson, a Nunn-area rancher who serves as president of the Weld County Farmers Union and as a board member of the Weld County Livestock Association; Luke Runyon, agribusiness reporter for KUNC and Harvest Public Media, the latter of which is a reporting collaboration of several public media stations across the country that covers issues related to food and food production; and Sater, a rancher and farmer with experience in the dairy industry. One of the topics brought up most was that of the use of genetically modified organisms, or GMOs, in food production. The farmers and ranchers on the panel explained to the crowd that humans have been genetically modifying crops and livestock for thousands of years, through cross-breeding. Jerke also stressed that he has no issue with labeling food that contains GMOs on a voluntary basis, but not making it mandatory, which has been a ballot measure in some states recently. Jerke said he was fine letting the producer or processor use the “GMO-free” label simply as a marketing tool, like the “organic” label is used. He and others on the panel further noted, though, that true GMO-free food might be tough to come by, because of genetic engineering’s deep roots historically in human food production. Peterson stressed the need for genetic modifying, explaining that his wheat crop one year was wiped out by pests before he began using a wheat variety that was resistant to it. On the issue of water, Jerke stressed that there’s “no simple answers” to the issue of groundwater management in the area, and noted the ongoing depletion of the Ogallala Aquifer. One of the world’s largest aquifers, underlying portions of eight states, including far east Colorado, South Dakota, Nebraska, Wyoming, Kansas, Oklahoma, New Mexico and Texas, is being mined and not replenished at an alarming rate, he said, and could become a major issue for the U.S. He further stressed agriculture’s needs for completion of two area water-storage projects still in the works — the Northern Integrated Supply Project, which if approved would include two new reservoirs and provide 40,000 acre feet of water to northern Colorado, and prevent the drying up of about 60,000 acres of farmground, according to supporters’ studies; and the Chatfield Reallocation, an endeavor that would raise the Denver-area lake by as much as 12 feet, and, in doing so, provide additional water for area farmers and others. In reference to the Chatfield project, Jerke said he didn’t understand why the studies and mitigation efforts to raise an existing reservoir just by 12 feet would cost the estimated $183 million. Sater stressed that one of his biggest needs in agriculture is labor, but there’s no affordable way to bring to the U.S. the migrant workers who are willing to do the work. “I do need labor, but don’t know what to do about it,” Sater said. Lahman said some of his customers tell him that labor shortage is the No. 1 issue they have. More South Platte River Basin coverage here. Heavy precipitation again pelted the northwestern and northeastern parts of this region, but dryness persisted farther south. Drought remained in the exceptional range in parts of California and northeast Nevada. Over 3 inches of precipitation fell from the northern Sierra Nevada and the Cascades westward to the Pacific Coast, with 5 to 10 inches reported in the higher elevations of the Cascades and in northeast California. As a result, D0 and D1 was reduced in western Washington, as was some D2 in southwest Oregon, but from Oregon southward, obvious relief was not as widespread and snowpack remained very low. In central and northern Idaho and some areas in nearby Washington and Oregon, 2 to 6 inches of precipitation was common. Conditions have improved in these regions significantly in the past few weeks, thus broad areas of improvement were introduced. In contrast, dryness and drought persisted farther south, where precipitation was lacking. Between 1 and 3 inches fell on the central and southern Sierra Nevada, but little or none was reported from western Utah, northern Nevada, and central California southward. Snowpack remained under 70 percent of normal roughly south and west of a line from northeast Oregon to north-central New Mexico, and was less than half of normal in southern Oregon, the Sierra Nevada and southern Cascades, northwestern Nevada, southwest Utah, and the higher elevations of Arizona and New Mexico. The next 5 days (March 12-16) should bring moderate precipitation (0.5 to 2.0 inches) from the lower Mississippi Valley eastward across the Southeast. New England, far northwestern Washington, deep south Texas are expected to measure 0.5 to 1.0 inch. Light amounts of up to 0.5 inch at best are expected elsewhere. For the ensuing 5 days (March 17-21), the odds favor above-normal precipitation along the immediate East Coast and in part of the Alaskan Panhandle. In contrast, there are enhanced chances for drier-than-normal conditions in a broad area covering much of the central and western states. Specifically, along a stripe from the Ohio and middle Mississippi Valleys westward through the central Rockies, California, and Oregon…and from there southward to the Mexican border and Gulf of Mexico coast. Neither wet nor dry conditions are particularly favored anywhere else. The Colorado River is the focus of a new Google Maps Street View project launched today in partnership with American Rivers. The imagery features the iconic Grand Canyon and marks the first time Google Maps has used the Street View technology on a major whitewater river in the U.S.The project brings renewed attention to the wonder and beauty of the Grand Canyon, as well as the challenges facing the Colorado River’s health. American Rivers named the Colorado River America’s Most Endangered River in 2013 because of the threat of outdated water management, over-allocation and persistent drought. Supported by the outfitter Arizona River Runners, American Rivers staff joined Google Maps on an eight-day float through the Grand Canyon in August 2013 to capture the river imagery. The Street View camera, on a special mount built for the raft, captured a full 360-degree photo sphere every few seconds. This allows users to “join the raft” and explore 286 miles of the river, from Lee’s Ferry to Pearce Ferry. Members of the team also wore the Street View Trekker camera to capture five popular side hikes, including the trail to the Nankoweap Granaries with a dramatic view overlooking the river. More Colorado River Basin coverage here and here. The Arkansas Basin Roundtable Wednesday reviewed its progress toward creating its part of the upcoming state water plan, planning a series of meetings to make sure all voices are heard. The meetings will be staged in areas throughout the region in order to assure water needs that have not surfaced in the past nine years of meetings are included in the Arkansas Basin implementation plan. “As we prepared for these meetings? Are we going to get flak jackets?” Canon City farmer Manny Colon jokingly asked. “Maybe combat gear,” replied interim Chairwoman Betty Konarski, who wore a hard hat to her inaugural meeting as head of the roundtable. 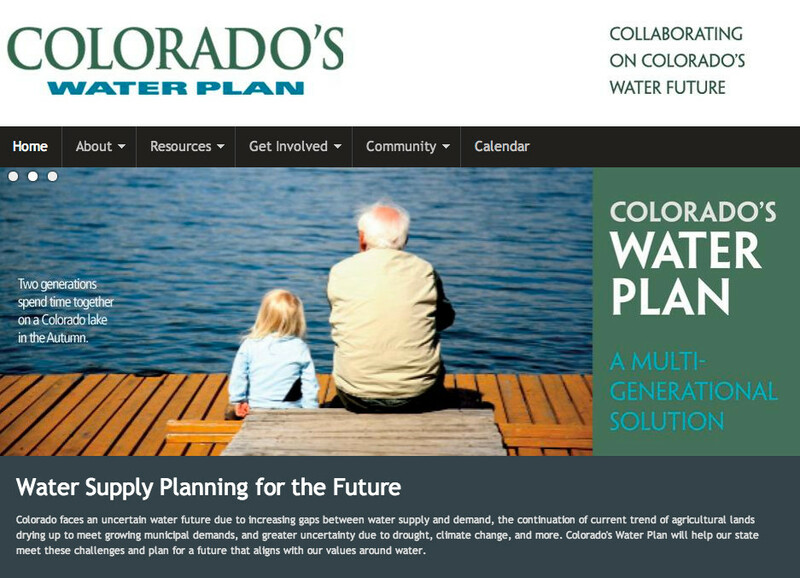 More Colorado Water Plan coverage here.